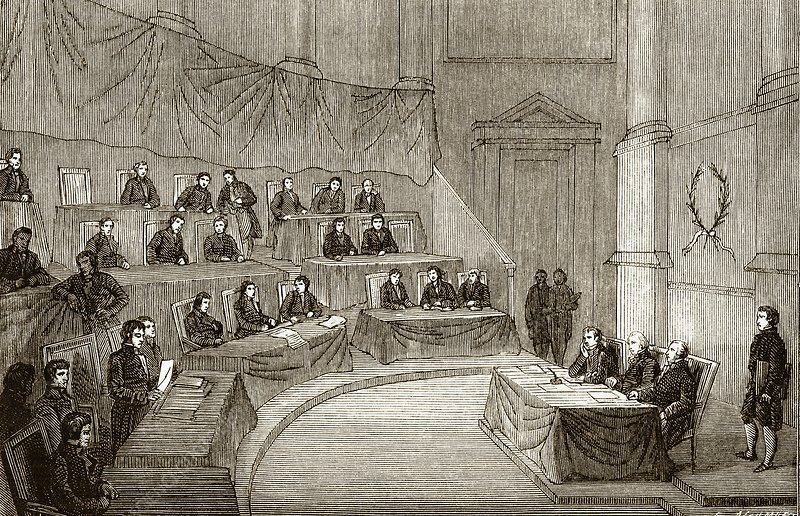 Volta addressing the French Academy of Sciences in the presence of Napoleon Bonaparte. In 1800 Volta invented the Voltaic Pile. He was invited to Paris to demonstrate his invention. During 1801 he gave a series of lectures to the Institute of France which became the French Academy of Science. These were attended by Napoleon Bonaparte. A gold medal was struck to honour Volta.Napoleon awarded him a pension and made him a Count. In 1802 Volta was elected one of eight foreign associates of the Academy. Bonaparte instituted the Volta Prize awarded by the French Government for scientific achievements in electricity. Recipients of the prize include Humphry Davy, Heinrich Ruhmkorff, Zenobe Gramme and Alexander Bell. Bell used his prize money to create institutions in the United States including the Volta Bureau which later became the Alexander Graham Bell Association for the Deaf.